Add instant glamour to any look with this stunning matching earring and pendant set. 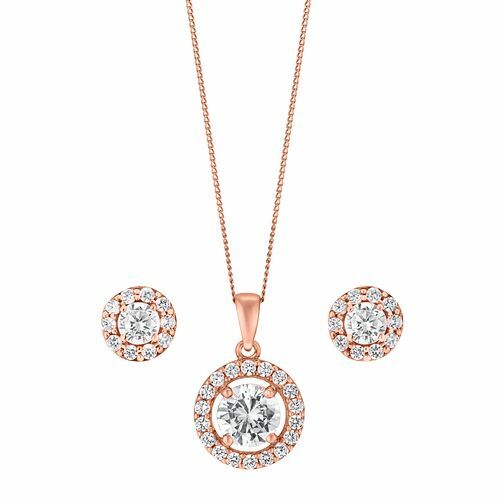 Crafted from warm 9ct rose gold for contemporary luxury, this pretty set features matching stud earrings and drop pendant with a shimmering round cubic zirconia at their centre and finished with a glittering halo of smaller stones for a look that's sure to dazzle. 9ct Rose Gold & Cubic Zirconia Halo Earring & Pendant Set is rated 1.0 out of 5 by 1. Rated 1 out of 5 by Anonymous from Over priced rubbish Bought as a Christmas present for my partner. Upon opening, she noticed that a stone was missing from the pendant and there was a loose stone on one of the earrings. Returned for refund.